Developing innovative ranges since 1999, Forma is currently sold in more than 60 countries. 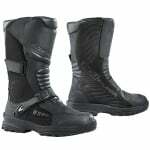 The company is highly specialized and produces all types of motorcycle boots with maximum attention is given to safety. Almost all of the range (with only the exception of some urban shoes) are CE approved EN 13634:2010/12 by the main Italian testing and research centre Ricotest. First of all, service from Sportsbike shop superb as always. On to the boots. 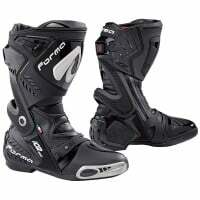 Good stiff sole, appear to be nicely made and easy to get on and off, much easier than full scale off road boots. The pattern of the sole means that they don't move easily on the pegs, but you get used to it. Very easy to get on and off, the closing systems all working very well. Once "broken in", which didn't take very long, they are comfortable both on and off the bike. Sizing. 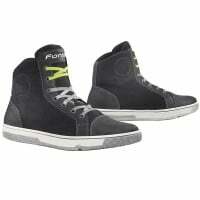 I take 43 in most footwear, went with 44 for these. Fit well, with just a little extra room available for thicker socks in cold weather. Not tried in the rain yet so cannot comment on waterproofing. Overall, happy. Decent value boots. 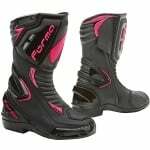 Bought these boots to wear with Kevlar jeans. 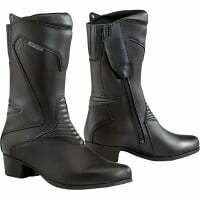 The boots are well made and very comfortable, could easily be worn for long periods. The fitting is made easy with the side zip closure. I would have preferred a permanent reinforcement for gear lever operation as a bit of a faff fitting elasticated strap which needs removing when off the bike as would easily wear through if walking on it (I dont use it). Very happy with purchase and would recommend.